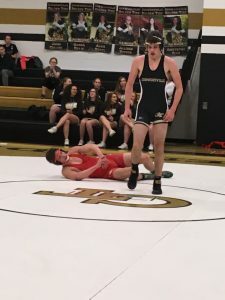 CURWENSVILLE – Two weeks ago, the Golden Tide wrestlers bested Punxsutawney by a score of 36-33. Monday night, the score flip-flpped, and Punxsy was able to return the favor, edging out the Tide with a 39-32 victory. Though the match started at 106, the first five matches were forfeits, and the action finally picked up at 138 when Curwensville sophomore Caleb Stiles (0-3) was pinned in 30 seconds by Punxsy’s Jake Starbek. There was another forfeit at 145, and then the meat of the match began at 152 when Golden Tide freshman Jake McCracken (10-3) battled the Chucks’ Caleb Bender. McCracken gave up a takedown in the first period, and was turned for two nearfall in the second. However, McCracken never quit wrestling and was able to get momentum back on his side with a reversal to end the second period. Up 4-2, Bender chose neutral, and McCracken took him down to tie the match. Wrestling tough on top, McCracken turned and pinned Bender in 5:35. This put the match at 30-12, in favor of Curwensville. Then sophomore Steven McBride (2-5) ran into a buzzsaw in the Chucks’ Garrett Eddy and was pinned in just 54 seconds, cutting the lead Curwensville had to six points with a 30-24 score. In the most entertaining match of the night, first year Curwensville wrestler Nick Holbert (3-5) squared off against Hunter Perry. Scoreless through the first period, the sophomore Holbert chose bottom in the second and was awarded a technical point on an interlock before getting an escape, but would be then be taken down. The score was tied going into the third period at two points apiece when Perry chose neutral. Holbert gave up another takedown, but he was given another foul point after being full-nelsoned. Holbert then got an escape and a takedown of his own. In the final 30 seconds of the match, Holbert had no problems holding down Perry, but his inexperience showed and he gave up two foul points of his own, forcing overtime. The crowd was going wild, loving every second of the young men’s performance, but ultimately Holbert fell to Perry, giving up a takedown in the one minute “sudden victory” period. 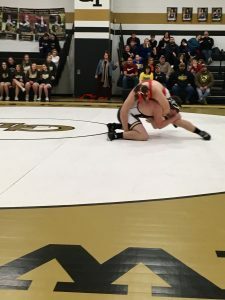 Holbert then gave up a team point when he threw his headgear on the mat, but Coach Swatsworth chalked that up to a “rookie mistake.” “He doesn’t like to lose, and it’s not a rule he knew.” This made the match 29-27, Curwensville. 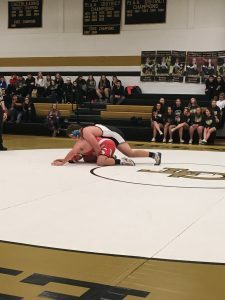 At 195, Tristen Bair made short work of Curwensville sophomore Gage Roos (0-10), pinning him in 32 seconds, and then Curwensville had to forfeit at 220, making the match 39-29, Punxsutawney. In the final bout of the night, Golden Tide senior Steven McClure (11-1) wrestled Alexander Neal and won by an identical 5-1 from the last time they wrestled. At the end of the second period, McClure pulled off an amazing takedown as time expired in what Coach Swatsworth could only describe as “knowing where you are on the mat.” McClure then got an escape and a takedown in the third period. Overall, Coach Swatsworth was proud of his team. They didn’t have a few matches go the way they wanted them to, but he said “His team is getting better every match, and they are working hard in the practice room.” He said he can’t ask anything more from them. On Thursday, Curwensville will travel to Saint Mary’s to wrestle the Flying Dutch. With the loss, they have fallen to 3-7.